In 1984, Dr. Robert Ulrich published a study in which the effect of the hospital room environment of 46 patients recovering from gall bladder surgery was observed (Robert S. Ulrich, “View Through a Window May Influence Recovery From Surgery,” Science, Vol. 224, Issue 4647, 1984 p. 420-421). The individuals were patients at a suburban Pennsylvania hospital between 1972 and 1981, when recovery from such surgery required a two-week hospital stay (now it’s two to three days). Half of the patients had been assigned to rooms with windows that looked out onto natural scenery. The other half had rooms with windows facing a brick wall of an adjacent building. The study showed that those patients looking on natural scenery had shorter post-operative hospital stays, received fewer negative comments in nurses’ evaluations, and took fewer pain medications than those looking at a brick wall. While this study wasn’t the first of its kind, Dr. Ulrich’s work has often been cited as a reason why hospitals and other healthcare facilities are now designed with the patient experience in mind. It is now well known that the environment in and around a healthcare facility has a profound effect on patient care and recovery. According to E.R.C.M. Huisman et al., “Evidence from various studies suggests that animals and pets, plants, views of natural landscapes, and active wilderness experiences have positive effects on human health and well-being. Additionally, there is a clear preference among [hospital] staff and patients to be surrounded by natural open settings.” (E.R.C.M. Huisman, E Morales, J. van Hoof and H.S.M. Kort, “Healing Environment: A Review of the Impact of Physical Environmental Factors on Users,” Building and Environment, Vol. 58, December 2012, p. 70-80). Dr. Ulrich’s study may have cast a negative shadow on brick walls, in that they might lend to a poor patient experience. However, brick is now frequently a material of choice in both renovation and new construction of hospitals, elder care facilities, doctors’ offices and other healthcare campuses. In fact, the International Masonry Institute has published an article on its website entitled “5 Ways That Masonry Improves Healthcare Facilities,” by Maria Viteri. Masonry not only contributes to energy savings and low exterior maintenance, but it can also assist with patient wayfinding and provide a sense of permanence in the community. 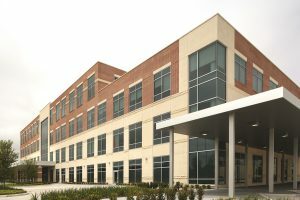 This article will showcase brick masonry and natural stone in a positive light in some recently constructed healthcare facilities. Spring, Texas, is situated about 20 miles north of downtown Houston. It’s a growing suburb, where the market opportunity for new healthcare facilities has been on the rise. Springwoods Village, whose slogan is “the new urban crossroads of North Houston,” is a mixed-use community being developed by CDC Houston Inc., with a 2,000-acre master plan that will be built out over the next 10 years or so. Springwoods Village blends family homes, hotels, restaurants and a retail district with corporate campuses and natural habitats. 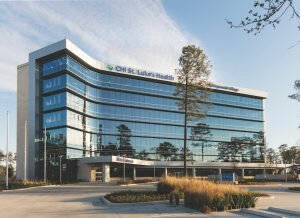 It even has its own 23-acre medical campus, developed by CHI St. Luke’s Health, consisting of 180,000 square feet of emergency services, medical offices, diagnostic imaging and an ambulatory surgery center. Ground was broken in 2014, and construction was completed in January 2016. Earl Swensson and Associates (ESa) had previously worked with St. Luke’s Episcopal HealthSystem before it was transferred to the Catholic Health Initiative (CHI) in 2013. The firm had also worked with CHI. ESa was part of developing the master plan for Springwoods Village. It was thus an ideal fit when ESa was subsequently asked to be part of designing Phase I, including the new medical facility, which is ultimately intended to support anywhere from 200 to 300 inpatient beds. The smooth-finish Cedar Hill Cream limestone was installed in a large format, with eachpiece being approximately 2 x 4 feet. Camarata Masonry Systems Ltd. (CMS) was responsible for the supply and installation of 26,000 square feet (4,200 pieces) of the limestone. But the installation of the limestone did not go as originally planned. According to CMS, “The intent was to have the stone cladding anchored to the heavy-gauge stud backup walls; however, the stud backup walls were to be covered with 3-inch-thick rigid foam insulation, preventing access for the structural attachment of the stone anchors.” Therefore, the limestone had to be hung as a veneer on a clip system so it wouldn’t penetrate the insulation, and each panel could be only 2 inches thick. CMS designed a special Z shape that could be anchored to the backup wall simultaneously with the 3-inch rigid insulation. This allowed for the attachment of the stone anchors without any penetrations of the insulation. The Z shape was precisely located to coincide with both the stone joints and the stone anchors. The Z shape was also included at each floor line to accommodate the necessary moving joint stone anchorage. The development of the Z shape allowed the uninterrupted placement of the insulation. CMS also furnished and installed 2,700 units of smooth-finish block site walls, strategically located around the building’s perimeter. A vast lake and miles of wilderness may not seem like the place for a hospital. But Cook, Minnesota, a small city of about 600 people located near Lake Vermillion and set within the Superior National Forest, has restaurants, stores, libraries, schools, banks, recreational resorts, a dental clinic, and, yes, even a hospital. For many years, the 14-bed, acute-care Cook Hospital has served northern Minnesota and the two million people who visit the Boundary Waters and Quetico canoe areas annually. But it was becoming outdated and needed long-term updates to its urgent care, nursing home and clinical care facilities. Ryan Turner, principal — healthcare for DSGW Architects, was part of the team that designed a financial strategy and a master plan to maximize Cook Hospital’s budgets and improve its operations. 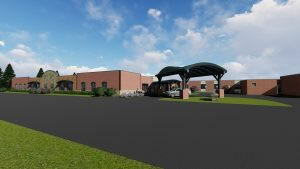 Together, DSGW and Cook Hospital decided on a major renovation and an addition. The renovation to the existing facilities consisted of increased privacy for patients, by directing less traffic around their rooms. The installation of centrally located nursing stations increased staff efficiency. The improved facility also boasts a refurbished laboratory. Brock White supplied the brick for the addition. More than 22,000 Coppertone Velour brick from Endicott were combined with 2,100 units from Sioux City Brick and another nearly 20,000 units of a Sioux City special blend. The limestone, however, was used to highlight the new entry to the building. With such a large number of recreational visitors requiring emergency care at this hospital, in addition to the needs of the local residents, it was important to make wayfinding simple and intuitive for incoming patients, beginning with the entrance. Why is wayfinding so important to the patient experience? As already discussed, patient recovery is affected by the surrounding environment. As G.F. Yücel writes in the book Advances in Landscape Architecture, “The outdoor as well as the indoor spaces of hospitals are understood as crucial to patients’ physical, psychological and social recuperation and wellness.” Hospitals can often be perceived as complicated mazes, accessed only out of necessity. However, with appropriate design that includes both master planning and landscaping, the perception of the hospital can become what Yücel terms “a comforting and stress-free environment.” (Gökçen Firdevs Yücel, “Hospital Outdoor Landscape Design,” Chapter 15 in Advances in Landscape Architecture, ed. Murat Özyavuz, 2013, ISBN 978-953-51-1167-2). Architects around the world are now aware of these effects on patients and visitors to healthcare facilities. HOK, a global design, architecture, engineering and planning firm, is serving as executive architect for the BJC HealthCare Washington University of Medicine Campus renewal project in St. Louis, Missouri. 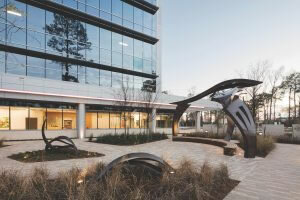 Just north of Spring, Texas, lies The Woodlands, another booming suburb of Houston where medical facilities are also growing. 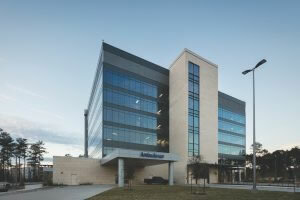 The Houston Methodist – The Woodlands Hospital, whose grand opening was in July 2017, is a full-service, acute-care hospital serving the north Houston region. The 187-bed, 470,000-square-foot hospital sits next to the campus’ first medical office building (MOB), which opened in March 2016 and has 150,000 square feet of space. A second MOB, six stories tall and more than 160,000 square feet, and a parking garage are being constructed in 2018. While working on the first MOB, Camarata Masonry Systems Ltd. (CMS) submitted a bid to Vaughn Construction for the hospital, and won the job. CMS therefore supplied and installed the masonry for both the hospital and MOB1, which included brick, granite, marble and more than 40,000 Renaissance Arriscraft units. Knee-high walls around the exterior of the hospital were also built out of the Arriscraft, providing outdoor paths and benches for patients and visitors. CMS encountered some challenges on the project. First, the typical Arriscraft piece is 3 5/8” thick. However, the design of the MOB portion called for a 1” projection, and the Arriscraft had to align with the brick to maintain a precise cavity of 2”. Thus, special thicker units had to be manufactured for this project, along with thicker corner units. The second challenge occurred because of the different heights among the Arriscraft, brick and window openings of the bed tower. All the relief angles on the six-story building had to be double-checked by all parties due to these different heights. From elevation to elevation, both the window sizes and the Arriscraft bands varied, making it critical to determine the exact location for the relief angles. 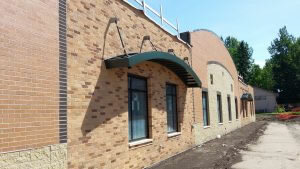 Personnel had to ensure that any adjustment worked around the entire building and the various elevations. Finally, for completion of the veneer, the masonry bond of the brick and Arriscraft had to be correct from one elevation to another. 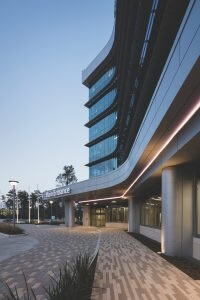 The state-of-the-art hospital building was awarded the 2017 Associated Builders and Contractors Houston Excellence in Construction Merit Award – Finish Exterior. However, as more and more architects design healthcare facilities with the patient in mind, masonry can be incorporated for such factors as familiarity, warmth and easier wayfinding, leading to a better overall experience for the patient and for healthcare as a whole.